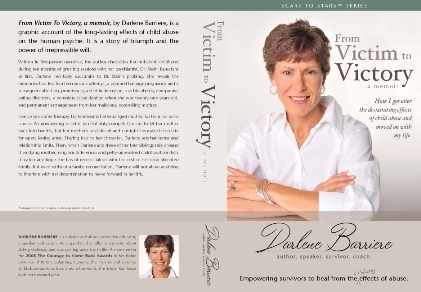 My Story of Abuse: Download From Victim to Victory today! Have you been through abuse? If so, that makes you a survivor. But that doesn't mean you haven't been stricken with effects. Chances are, you've got more than your fair share of troublesome effects. Those of us who survived child abuse know only too well how challenging it is to get past the effects and take back the control that was so cruelly stolen from us. I wrote my story of abuse in order to show you how I got over the devastating effects of child abuse and got on with my life. My story of survival will take you on a journey of triumph and irrepressible spirit and show you how you too can go from victim to victory. I assure you, you are not alone. I know this because so many of you have shared so bravely with me and with the visitors of this site what you endured as a child. Some of you have endured unspeakable crimes committed against you. Many of you have disclosed here what you've never before felt safe to reveal. Every one of you has shown remarkable courage in the face of the residual effects that abuse has had on you. I know and understand that courage. I too had to find the courage inside myself. I too had to face my fears. I too had to deal with my emotions. So many of us—way too many of us—have endured abuse by the very people in charge of protecting us and keeping us safe from harm. So often, those are the very people who hurt and harmed us the most. They are the ones who left us with the devastating, often lifelong effects of child abuse. We trusted them because we HAD to trust them. They had all the power. Power that changed who we were. We were left feeling alone, betrayed, abandoned, worthless, even unlovable. And worst of all, we were helpless. But we are NOT helpless anymore! I took BACK my power! You too can take back YOUR power. I'm here to tell you that you are NOT worthless. That you are NOT unlovable. And that it IS possible to find who You Really Are. Regardless of the pain you have suffered—and possibly continue to suffer—it IS possible to turn pain into power, and to use that power for your benefit and the benefit of others. That is the premise of this website. You CAN move from being a victim. You CAN become a survivor victorious. Regardless of the adversity you endured! Some of you already know that I lived through some pretty horrific abuse at the hands of both my mother and father. Not as horrific as some, perhaps more horrific than others; but I won't minimize what I lived through. It was hell, pure and simple. I was overwhelmingly affected; and in my view, that is the measure of hell. ¤ I started smoking to "fit in"
There is a truly positive side to my story. I was a survivor victorious! I wrote my story because I want my victories to shine through. Not just my memories, but the victories, great and small, that I achieved along my own path of healing and recovery. I want other survivors who are wracked with guilt and shame to know that it wasn't their fault. And that I understand why they might still believe it was their fault. You see, I too went through those terrible feelings. I too believed I was to blame because I believed the lies I had been told. But I got help. And with that help, along with a shift in mindset, I was able to let go of all the lies I had come to believe. I want other survivors who are desperately trying to cope with feelings of hopelessness and despair to know that they're not alone; I too was stricken with those same hopeless thoughts, even suicidal thoughts. And I found Who I Really Am when I got the help I needed. I want other survivors to know there IS hope. Real hope. I'm a testament to that hope. My story can help you find that hope! I want you to believe in yourself. You ARE deserving of dignity and respect. The world IS a better place because you're here. No one believes that more than I do. You CAN turn pain into power. Now it's your turn to believe it. You're too special NOT to! From Victim to Victory, a memoir is a quick and simple download from here. PayPal is used as a secure, authorized billing agent for your security. Your credit card is validated through PayPal´s ordering system and once payment is made, you will be re-directed to a download page. Once there, you can retrieve the e-book and start reading straight away. The e-book is $11.99CDN and in PDF format (if you need it, a free PDF reader is available on the download page) with a file size of approximately 1.90 MB. Download times vary according to your Internet connection (less than 2 minutes with ADSL/Broadband). If security is a concern to you, rest assured that a secure server is used to process your order.